Alexander Winton was born in Grangemouth, Scotland in 1860 and when aged nineteen he emigrated to the United States. After a spell as a ship's engineer he established a bicycle business in Cleveland, Ohio in 1892 and the first experimental Winton automobile was on the road in 1896. 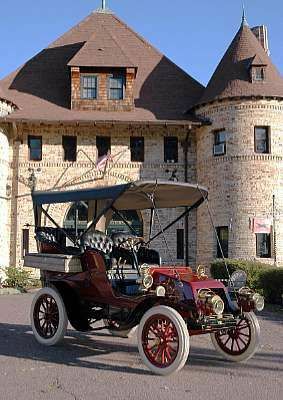 By the end of 1898 twenty-two single-cylinder cars had been sold and orderly production saw output rise to 55 in 1899 and 200 the following year. Among the efforts Winton made to publicise his products was an entry in the first Gordon Bennett race of 1900 in France, a process he repeated again in 1903 this time on Irish roads. On neither occasion did he meet with any success but the 1903 straight-eight horizontal-engined 'Bullet' racers did break sprint records. Winton production cars grew in size and refinement but with output only ever peaking at around 2500 per year they were competing in a limited market where there was much else on offer. Winton closed his automobile business in 1924 and died in 1932.